For other people named Scott Parker, see Scott Parker (disambiguation). * Senior club appearances and goals counted for the domestic league only and correct as of 20:24, 2 December 2016 (UTC). Scott Matthew Parker (born 13 October 1980) is an English professional footballer who plays as a midfielder for Championship club Fulham. Parker began his career at Charlton Athletic, and was loaned to Norwich City, before joining Chelsea for a £10 million fee in January 2004. He did not play regularly at Chelsea, and moved to Newcastle United the following year, where he was made captain. Parker joined West Ham United in 2007, and was the FWA Footballer of the Year for the 2010–11 season despite the club being relegated. He was then signed by Tottenham Hotspur and joined Fulham in 2013. He has represented England at every level from under-16 to senior, making his full debut in 2003. Uniquely, he won his first four England caps while playing for four different clubs. Parker was a member of the England team which reached the quarter-finals at UEFA Euro 2012. Parker was born in Lambeth, London, and attended Haberdashers' Aske's Hatcham College in New Cross Gate. As a 13-year-old, he appeared in a well-known English advert for McDonald's, in which he played keepie uppie, during the 1994 FIFA World Cup campaign. Parker is a graduate of The Football Association's now-defunct national School of Excellence at Lilleshall. After graduating from Lilleshall, Parker signed for Charlton Athletic as a trainee and made his first team debut as a substitute against Bury in the First Division on 23 August 1997, a match which ended 0–0. He signed his first professional contract with the club two months later. Over the next couple of years he made only a few sporadic substitute appearances for Charlton, although he was one of the brightest prospects in English football. In October 2000, Charlton, then in the Premier League, loaned Parker to First Division club Norwich City for two months to give the England under-21 international some first team experience. At Norwich he scored once against Sheffield Wednesday. On his return to The Valley, Parker was immediately called into the first team to replace injured captain Mark Kinsella. Parker played so well for Charlton that, upon his return from injury, Kinsella could not regain his place in the starting line-up. Parker soon became the linchpin of Charlton's midfield, combining tenacious tackling with an ability to carry the ball quickly from defence to attack and play telling passes, creating many chances for his teammates. Parker, who had been consistently linked with moves away from Charlton for several years, finally left the Valley on 30 January 2004 to join Chelsea on a four-and-a-half-year contract for a £10 million fee. Alan Curbishley, the Charlton manager, criticised his attitude following news of Chelsea's interest, accusing him of bad behaviour and saying that "...his conduct in training has not been what it should have been." Parker was initially signed as cover for Claude Makélélé and Frank Lampard, but did not get too many chances to play in his preferred position. He scored his only goal for Chelsea in a 2–0 win against Portsmouth at Fratton Park on 11 February. At the end of the 2003–04 season, Parker was named as the PFA Young Player of the Year. Following the summer signings of Arjen Robben and Tiago Mendes, Parker's first-team opportunities were limited during 2004–05. Although he found first-team opportunities hard to come by at Chelsea, he was a regular starter in Chelsea's League Cup matches, a competition where he played in three consecutive victories against West Ham, Newcastle and Fulham. His problems were compounded when he broke a metatarsal bone in a match against his former club, Norwich City. Due to this injury, Parker missed both legs of the League Cup semi-final against Manchester United and the final against Liverpool, although he took part in the celebrations. Having made only four league appearances for Chelsea during the season, he did not receive a Premier League winner's medal as the club won the English title for the first time in 50 years, as he did not make the required 10 appearances to be eligible, though Chelsea did have a replica medal made. Parker was sold the following summer, moving to Newcastle United in July 2005 for a £6.5 million fee. He became a regular in the Newcastle first team and was one of the few players at the club to show any consistency during an often difficult season in which Newcastle finished in seventh place, despite having a very poor start under Graeme Souness. His first Newcastle goal came against his former club Charlton in a 3–1 defeat on 25 March 2006. Later that month he was diagnosed with glandular fever, putting an end to his season. The timing was especially unfortunate for Parker, who had been playing well for Newcastle, as it ended any hopes he may have had of forcing his way into the 2006 FIFA World Cup. In July 2006, he was named Newcastle United's new captain by manager Glenn Roeder, succeeding the retired Alan Shearer. His first goal as captain came against Wigan Athletic on 19 August 2006, in a 2–1 win on the first day of the season. Parker scored his second goal of the season against Fulham in September 2006, but after he was substituted Newcastle conceded 2 goals and subsequently lost the match. Despite Newcastle's poor form, his performances earned him a recall to the England squad in September after an absence of more than two years. In November, Parker scored a goal in the 116th minute against Watford in the League Cup and then scored in the penalty shoot-out to allow Newcastle to progress in the competition. He scored his fourth goal of 2006–07 against Tottenham Hotspur in December 2006. Scott Parker was found to be the second best player in the country for December 2006 by Sky Sports and Opta Index. He led Newcastle on their way to UEFA Intertoto Cup victory and was presented with the Intertoto Cup plaque in March 2007 before the UEFA Cup first leg tie with AZ, which Newcastle won after a thrilling finish. In June 2007, West Ham United signed Scott Parker for a £7 million fee. Due to injury, he did not make his first team debut until 26 September 2007 in the 1–0 League Cup victory against Plymouth Argyle. His full Premier League debut came on 29 September 2007 in the 1–0 home defeat to Arsenal, a match which saw Parker sustaining another injury and being substituted for Hayden Mullins at half-time. Parker scored his first goal for West Ham, a last-minute winner in the 2–1 win at Middlesbrough on 22 December 2007. In 2008–09, Parker played a major part of West Ham's season and on 24 May 2009 was voted Hammer of the Year, by the club's supporters. and became the first player since Julian Dicks in 1997 to retain the award after winning again on 4 May 2010. He was again one of West Ham's key players in 2009–10, scoring the winning goal in a vital 3–2 win against Wigan Athletic, which ensured another season of Premier League football for West Ham. In July 2010, West Ham chairman David Sullivan stated that Parker was not for sale to another club at any price. This came after a bid from Tottenham Hotspur and also public interest from Aston Villa. In September 2010 Parker signed a new, five-year, contract with West Ham which also made him the highest paid player in the club's history. Parker scored three goals in his first six appearances in 2010–11. His goals came in matches against Oxford United, Chelsea, and Stoke City. He is widely regarded as one of the most consistent English midfielders over the last few years. There were calls from England supporters and Avram Grant for the midfielder to be included in England's squad and feature on a regular basis. On 12 February Carlton Cole praised Scott Parker's "inspirational" pep talk at half time after, being 3–0 down, West Ham earned a 3–3 draw against West Bromwich Albion. Cole was quoted as saying of the talk "If you were there you would have had a tear in your eye". Parker was named Premier League Player of the Month for February 2011 following his performances in West Ham's 3–1 wins over Blackpool and Liverpool. Following his performances for West Ham despite their relegation, and his England recall, Parker was placed on the six-strong shortlist for the prestigious PFA Players' Player of the Year Award. He missed out on the PFA award but was named the FWA Footballer of the Year. Parker started the first four matches of 2011–12 for West Ham United in the Championship and scored his first goal of the season, and tenth league goal for the club against Watford on 16 August 2011. Amid speculation that Tottenham Hotspur would sign the player, Parker handed West Ham co-owner David Gold a hand written transfer request, saying "I have had a fantastic four years at West Ham United and will never forget all the support I have had from the fans and everyone associated with the club." "The manager and board have tried hard to convince me to stay but at this stage in my career, I need to be playing in the Premier League, especially now that I am involved with England." "I hope the fans will understand and respect my decision and I wish the club every success in their fight for promotion this season." On 31 August 2011, Tottenham and West Ham both announced the transfer of Parker to Spurs, with the fee believed to be £5.5 million. Tottenham said "We are delighted to announce that we have reached agreement with West Ham United for the permanent transfer of Scott Parker." Later, Redknapp revealed that he was stunned that Tottenham could capture Parker ahead of rival clubs. With Scott Parker playing for Tottenham Hotspur, it meant that he was the only player to represent clubs in North, East, South and West London in the Premier League. On 10 September 2011 Parker made his Spurs' debut, providing an assist for fellow debutant Emmanuel Adebayor. He made his home debut the following week in a 4–0 win over Liverpool. Parker finished his first four matches for Tottenham on the winning team. He captained them in a 2–1 away win over Blackburn on 23 October. Parker finished his first season at Tottenham being named as their Player of the Year. Parker was injured on international duty before the start of 2012–13 and did not make his first appearance of the season until 16 December as a 90th-minute substitute. American journalist William Saletan had high praise for Parker's defensive skills after seeing the QPR match in person at White Hart Lane. "Parker doesn't score or get credited with assists. He leaves that to the guys up front," he wrote. What Parker does instead is win games. He does this not by punctuating the match but by controlling it. He smothers oncoming attacks. He forces opponents off the ball. He orchestrates distribution out of the back, setting in motion a Spurs onslaught that will culminate 60 yards downfield ... You can't watch the game up close without noticing Parker. On 19 August 2013, Parker signed a three-year deal with Fulham, for an undisclosed fee. On 23 November 2013, Parker was made temporary captain for the match against Swansea City in the absence of Brede Hangeland, and scored his first goal for them in the 1–2 loss at Craven Cottage. Fulham were relegated at the end of the season. Parker has represented England at every level from under-16 to the senior team. He earned nine caps for the England under-21 team. Parker's international debut for the senior England team came on 16 November 2003 when he came on in the 66th minute as a substitute replacing Wayne Rooney in a 3–2 defeat against Denmark. His form earned him a place in the starting line-up for England's European Championships qualifier away to Croatia on 11 October 2006. In a 3-5-2 formation Parker was restricted to tracking back and covering due to the attacking players in the team like Frank Lampard and Steven Gerrard. England boss Steve McClaren specifically told Parker to chase the wingers and assist the two wing backs, Gary Neville and Ashley Cole. England lost 2–0 and Parker would not feature again for England for four-and-a-half years. On 11 May 2010, Parker was revealed to be among manager Fabio Capello's 30-man preliminary squad list for the 2010 FIFA World Cup. However, he was not included in the final 23-man squad. On 9 February 2011, he came on as a second-half substitute for Frank Lampard in a friendly against Denmark to become the first player to receive his first four full caps whilst playing for four different teams. On 26 March 2011, Parker played in the Millennium Stadium against Wales in the qualifiers for UEFA Euro 2012 and was recognised as one of England's top players in the victory, acting as a holding midfielder in Capello's newly adopted 4–3–3 formation. On 12 November 2011, Parker was named man of the match in a friendly against UEFA Euro 2008 and 2010 FIFA World Cup winners Spain in the 1–0 win. Parker captained England on 29 February 2012 in their 2–3 defeat by the Netherlands at Wembley. Following Roy Hodgson's appointment as England manager, Parker was selected as part of England's UEFA Euro 2012 preliminary squad and was kept in for the final 23-man squad. He started all four of England's matches, helping the team top their group with wins against Sweden and Ukraine and a draw with France before they were knocked out in the quarter finals by Italy. He is known as a tough tackling central midfielder. On the international stage, Parker has been among the notable England players to have been criticised and panned for their hard-working but less technical style of play. Overlooked for major tournaments such as UEFA Euro 2004 and the 2010 FIFA World Cup, Parker was during 2012 a regular presence in the line-up, being partnered with Steven Gerrard. Although England had a relatively disappointing Euro 2012 campaign, some viewed the partnership of Parker and Gerrard as one of the positives. Parker is the brother-in-law of Bournemouth midfielder Harry Arter, having been in a relationship with the latter's sister, Carly, for over 15 years. He has four sons. 1 2 3 4 5 Hugman, Barry J., ed. (2010). The PFA Footballers' Who's Who 2010–11. Edinburgh: Mainstream Publishing. p. 328. ISBN 978-1-84596-601-0. 1 2 Wallace, Sam (10 February 2011). "Bent and Young deliver polished auditions for roles in England future". The Independent. London. Retrieved 10 February 2011. 1 2 3 4 5 "Scott Parker factfile". West Ham United F.C. 6 June 2007. Archived from the original on 6 November 2009. ↑ "Scott Parker Biography". Flown From The Nest. 6 June 2005. Retrieved 19 March 2007. ↑ Jackson, Jamie (4 December 2010). "Scott Parker is key to guiding West Ham away from the relegation zone". The Guardian. London. Retrieved 6 June 2011. ↑ "Sheff Wed 3–2 Norwich". BBC Sport. 11 November 2000. Retrieved 27 February 2010. ↑ "Parker joins Chelsea". BBC Sport. 30 January 2004. Retrieved 10 February 2011. ↑ "Curbishley hits out at Parker". BBC Sport. 29 January 2004. Retrieved 4 December 2007. ↑ "Portsmouth 0–2 Chelsea". BBC Sport. 11 February 2004. Retrieved 8 September 2009. ↑ "Player's Player Awards: Young Player of the Year 1974–2007". Professional Footballers' Association. Archived from the original on 27 May 2007. Retrieved 13 June 2007. ↑ "Chelsea 1-0 West Ham". BBC Sport. 27 October 2004. ↑ "Newcastle 0-2 Chelsea". BBC Sport. 10 November 2004. ↑ "Fulham 1–2 Chelsea". BBC Sport. 30 November 2004. ↑ "Parker blames injury on new pitch". BBC Sport. 22 December 2004. ↑ "Newcastle seal £6.5m Parker deal". BBC Sport. 15 June 2005. Retrieved 6 June 2007. ↑ "Charlton 3–1 Newcastle". BBC Sport. 26 March 2006. Retrieved 15 September 2009. ↑ "Fever brings end to Parker season". BBC Sport. 31 March 2006. Retrieved 10 February 2011. ↑ "Parker named as Newcastle captain". BBC Sport, 14 July 2006. Retrieved 6 June 2007. ↑ Chowdhury, Saj (19 August 2006). "Newcastle 2–1 Wigan". BBC Sport. Retrieved 8 September 2009. ↑ Sinnott, John (9 September 2006). "Newcastle 1–2 Fulham". BBC Sport. Retrieved 8 September 2009. ↑ "Watford 2–2 Newcastle (aet)". BBC Sport. 7 November 2006. Retrieved 8 September 2009. ↑ Fletcher, Paul (23 December 2006). "Newcastle 3–1 Tottenham". BBC Sport. Retrieved 8 September 2009. ↑ "West Ham sign Parker in £7m deal". BBC Sport. 6 June 2007. Retrieved 27 July 2008. ↑ Shea, Julian (22 December 2007). "Middlesbrough 1–2 West Ham". BBC Sport. Retrieved 28 April 2010. ↑ Parker named Hammer of the Year Archived 3 June 2012 at the Wayback Machine. West Ham United F.C. 24 May 2009. ↑ "Peerless Parker". West Ham United F.C. 4 May 2010. Archived from the original on 7 May 2010. Retrieved 5 May 2010. ↑ Bevan, Chris (24 April 2010). "West Ham 3–2 Wigan". BBC Sport. Retrieved 28 July 2010. ↑ "David Sullivan rejects Tottenham offer for West Ham's Scott Parker". The Guardian. Location. Press Association. 28 July 2010. Retrieved 9 September 2010. ↑ "David Sullivan tells Aston Villa to forget about a move for Scott Parker". Evening Standard. London. 21 July 2010. Archived from the original on 15 September 2010. Retrieved 9 September 2010. ↑ "Scott Parker signs new West Ham United deal". ESPN. 9 September 2010. Retrieved 9 September 2010. ↑ "West Ham 1–0 Oxford Utd". BBC Sport. 24 August 2010. Retrieved 18 September 2010. ↑ "West Ham 1–3 Chelsea". BBC Sport. 11 September 2010. Retrieved 18 September 2010. ↑ "Stoke 1–1 West Ham". BBC Sport. 18 September 2010. Retrieved 18 September 2010. 1 2 Jackson, Jamie (4 December 2010). "Scott Parker is key to guiding West Ham away from the relegation zone". The Guardian. London. ↑ Wilson, Jeremy (15 November 2010). "West Ham find hope in character of Scott Parker and Mark Noble despite being held by Blackpool". The Daily Telegraph. London. ↑ "Manager on Monday". West Ham United F.C. 15 November 2010. Retrieved 10 February 2011. ↑ "Cole hails 'inspirational' Scott Parker team-talk". BBC Sport. 12 February 2011. Retrieved 1 March 2011. ↑ "Wenger & Parker win Premier League awards for February". BBC Sport. 4 March 2011. Retrieved 4 March 2011. ↑ "West Ham's Scott Parker wins Football Writers' award". BBC Sport. 22 April 2011. Retrieved 22 April 2011. ↑ Watford Observer 17 August 2011. ↑ "Scott Parker on verge of joining Spurs after handing in transfer request". Metro. 30 August 2011. Retrieved 18 September 2011. ↑ Hytner, David (31 August 2011). "Scott Parker completes £5.5m switch to Tottenham from West Ham". The Guardian. London. Retrieved 31 August 2011. ↑ "Scott Parker completes Tottenham move". BBC Sport. 31 August 2011. Retrieved 31 August 2011. ↑ "Parker completes move". Tottenham Hotspur F.C. 31 August 2011. Retrieved 31 August 2011. ↑ "Spurs boss Redknapp revels in Parker capture as Tottenham climb table". Daily Mail. London. 23 November 2011. Retrieved 30 November 2011. ↑ " BBC Sport — Scott Parker completes Tottenham move. ↑ "Wolverhampton 0–2 Tottenham". BBC Sport. 10 September 2011. Retrieved 19 September 2011. ↑ "Tottenham 4–0 Liverpool". BBC Sport. 18 September 2011. Retrieved 19 September 2011. ↑ Saletan, William (3 November 2011). "Guts, No Glory". Slate. Retrieved 3 November 2011. ↑ "Scott Parker signs". Fulham F.C. 19 August 2013. Retrieved 19 August 2013. ↑ "Fulham 1–2 Swansea". BBC Sport. 23 November 2013. Retrieved 11 May 2014. ↑ "Fulham's relegation and the curse of Michael Jackson's statue". BBC News. 7 May 2014. Retrieved 16 April 2015. ↑ "England Scott Parker". The Football Association. Retrieved 1 October 2010. ↑ "Scott Parker". The Football Association. Retrieved 10 February 2011. ↑ McNulty, Phil (11 October 2006). "Croatia 2–0 England". BBC Sport. Retrieved 7 November 2014. ↑ "Fabio Capello makes surprise England World Cup choices". BBC Sport. 11 May 2010. Retrieved 10 February 2011. ↑ Winter, Henry (26 March 2011). 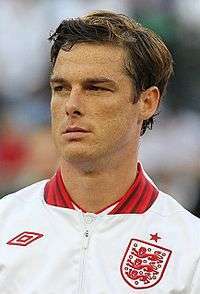 "Wales v England: The Impressive Scott Parker showed in Cardiff he is central to Fabio Capello's fresh start". The Daily Telegraph. London. Retrieved 11 April 2011. ↑ Cass, Bob (13 November 2011). "We won't get cocky after beating Spain, says England midfielder Parker". Daily Mail. London. Retrieved 1 March 2012. ↑ "England 2–3 Netherlands". BBC Sport. Retrieved 1 March 2012. ↑ "Scott Parker – a career in pictures". The Daily Telegraph. London. 22 April 2011. Retrieved 31 August 2011. ↑ "Scott Parker shows qualities that earned him England captain's armband against Holland.". The Daily Telegraph. London. 1 March 2012. ↑ "Euro 2012: England midfielders Steven Gerrard and Scott Parker prove their strength under pressure.". The Daily Telegraph. London. 12 June 2012. ↑ "Arter praises 'brother' Parker". Orange. 6 March 2012. Archived from the original on 28 December 2014. Retrieved 23 March 2015. ↑ "AFC Bournemouth: Harry Arter ready for Scott Parker battle". BBC Sport. 23 December 2014. Retrieved 23 March 2015. ↑ "Games played by Scott Parker in 1997/1998". Soccerbase. Centurycomm. Retrieved 26 September 2016. ↑ "Games played by Scott Parker in 1998/1999". Soccerbase. Centurycomm. Retrieved 26 September 2016. ↑ "Games played by Scott Parker in 1999/2000". Soccerbase. Centurycomm. Retrieved 26 September 2016. 1 2 "Games played by Scott Parker in 2000/2001". Soccerbase. Centurycomm. Retrieved 26 September 2016. ↑ "Games played by Scott Parker in 2001/2002". Soccerbase. Centurycomm. Retrieved 26 September 2016. ↑ "Games played by Scott Parker in 2002/2003". Soccerbase. Centurycomm. Retrieved 26 September 2016. 1 2 "Games played by Scott Parker in 2003/2004". Soccerbase. Centurycomm. Retrieved 26 September 2016. ↑ "Games played by Scott Parker in 2004/2005". Soccerbase. Centurycomm. Retrieved 26 September 2016. ↑ "Games played by Scott Parker in 2005/2006". Soccerbase. Centurycomm. Retrieved 26 September 2016. ↑ "Games played by Scott Parker in 2006/2007". Soccerbase. Centurycomm. Retrieved 26 September 2016. ↑ "Games played by Scott Parker in 2007/2008". Soccerbase. Centurycomm. Retrieved 26 September 2016. ↑ "Games played by Scott Parker in 2008/2009". Soccerbase. Centurycomm. Retrieved 26 September 2016. ↑ "Games played by Scott Parker in 2009/2010". Soccerbase. Centurycomm. Retrieved 26 September 2016. ↑ "Games played by Scott Parker in 2010/2011". Soccerbase. Centurycomm. Retrieved 26 September 2016. 1 2 "Games played by Scott Parker in 2011/2012". Soccerbase. Centurycomm. Retrieved 26 September 2016. ↑ "Games played by Scott Parker in 2012/2013". Soccerbase. Centurycomm. Retrieved 26 September 2016. ↑ "Games played by Scott Parker in 2013/2014". Soccerbase. Centurycomm. Retrieved 26 September 2016. ↑ "Games played by Scott Parker in 2014/2015". Soccerbase. Centurycomm. Retrieved 26 September 2016. ↑ "Games played by Scott Parker in 2015/2016". Soccerbase. Centurycomm. Retrieved 26 September 2016. ↑ "Games played by Scott Parker in 2016/2017". Soccerbase. Centurycomm. Retrieved 26 September 2016. ↑ "Parker, Scott". National Football Teams. Retrieved 27 September 2016. ↑ "Scott Parker named England Player of the Year by fans". BBC Sport. 28 February 2012. Retrieved 29 February 2012. Wikimedia Commons has media related to Scott Parker.